(Comes w/ membership) Click the PayPal button to subscribe! The ProjectBronco.COM Club T-Shirts are top-quality, 100% heavy-weight cotton shirts by Gildan ActiveWear. Each shirt features a full-color 3 1/2" club logo on the left breast and a full-color, 12" club logo on the back. They are currently available in four sizes, including size M, L, XL, & 2XL. The ProjectBronco.COM Club Magnets are today's answer to the bumper sticker. These magnets are nearly 6" in diameter, made of 30 mill vinyl and are designed specially for out-door use. Will not fade or harm your paint job in any way. The ProjectBronco.COM Club Decals are made of top-quality, 100% vinyl material. They are specifically designed for out-door use and will not fade over time. They are "out-side decals" measuring just 3 1/2" so you can put them on your tinted windows or even stick one on your bumper. 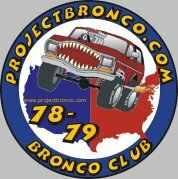 The ProjectBronco.COM Club Business Cards are your ticket to meeting Bronco owners in your area. They are professionally printed and feature a place for your name, phone number, and e-mail address. Shipped in a package of 10 cards. Leave one on the windshield of another Bronco the next time you see one!